Mr. Feliciano (Chano) Chavez, age 104, passed away at home in Albuquerque on Tuesday, November 27, 2018, he is now in heaven and in the presence of our Lord. Mr. Chavez is survived by his three sons, Leonides Chavez and wife, Mary, Lawrence Chavez and Herman Chavez; five daughters, Jeanette Contreras and Liz Montano, Dolores Romero and husband, Delfin, Elizabeth Ramirez and husband, Joe, Rita Aranda and husband Daniel, Martha Chavez and husband, Ray Atkinson; brother-in-law, Ray Garcia and wife, Mary Therese; sister-in-law, Sefe Chavez; twelve grandchildren; twenty-one great-grandchildren and several great-great-grandchildren. He was preceded in death by his beloved wife, Reginita; daughter, Mary Baros and grandson, Rosendo Contreras. Feliciano, was born and raised in Torreon, New Mexico in 1914. 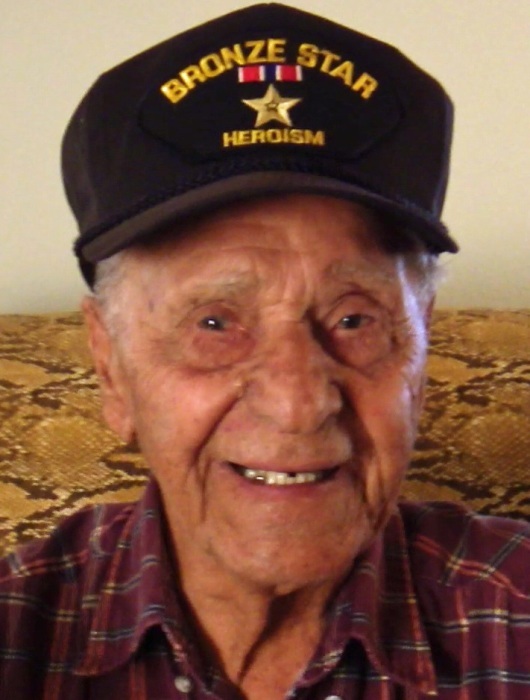 He was a WWII Army veteran, he fought admirably, in the Pacific & Atlantic, and as a Sharpshooter Rifleman in the Fifth Army, "Blue Devils-88th Infantry Division, 349th Infantry Regiment". 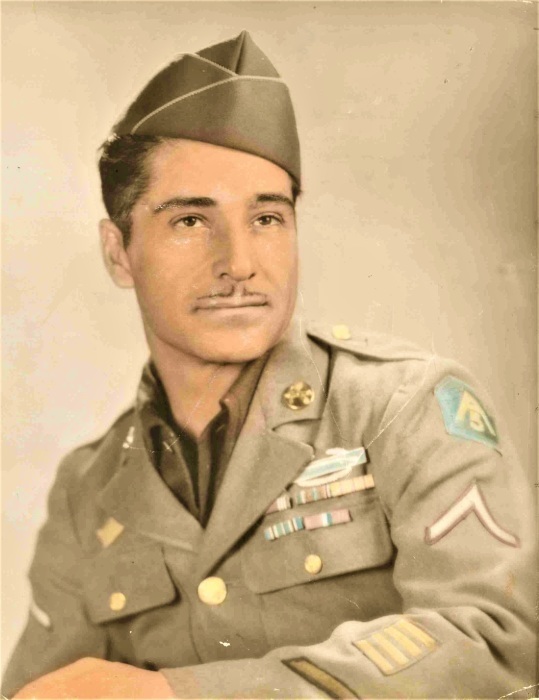 Feliciano received numerous commendations and medals including, the Award of the Combat Infantry Badge, Bronze Star Medal Combat. One month following his discharge he married, Reginita Garcia in 1946. Feliciano worked hard in farming to support his growing family in Torreon, had multiple jobs throughout NM, retiring from the Atomic Energy Commission. He worked as a school crossing guard finally retiring in his late 80’s. Chano was a longtime member of the St. Joseph Society as well as a longtime member of Our Lady of the Most Holy Rosary Catholic Church. A visitation will be held Monday, December 3, 2018 from 5:30 p.m. until 6:00 p.m. with a Rosary to be recited by Guillermo Candelaria at 6:00 p.m. at Our Lady of the Most Holy Rosary Catholic Church, 5415 Fortuna Rd. NW, in Albuquerque. Mass of Christian Burial will be celebrated on Tuesday, December 4, 2018 at 10:00 a.m. at the San Antonio Catholic Church in Torreon, New Mexico with Rev. Fr. Malachy Obidjesi officiating. Interment will follow services at the Torreon Cemetery. Pallbearers will be Patrick Trujillo Sr., Gilbert Romero, Dominic Romero, Mario Baros, John Ray Trujillo, and Paul Garcia. 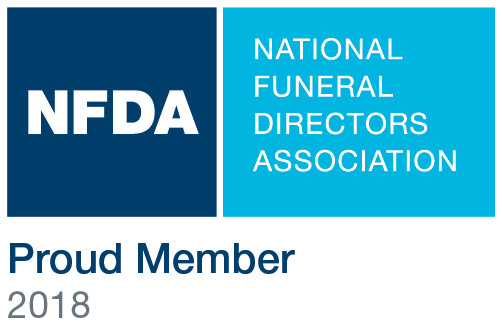 Honorary Pallbearers will be Patrick Trujillo Jr., & Peter John Trujillo.